Ocean View Estate in Playa Naranjo! This 7 Acres estate features breathtaking Ocean Views and a spacious 450 M2 / 4,840 square feet 3 bedroom home. There is still lots of room to build several other Ocean View structures. The property is very private yet close to the center, Ferry Dock and tropical beach of Playa Naranjo. 90% of this property features spectacular ocean views! A must see, photos dont do justice! 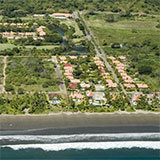 Ask our Costa Rica real estate office for more information!